A commonly used marketing strategy is that of the Brand Archetype. There are 12 archetypes on which brands can base their communication style, aspirational consumer perception and engagement outreach. 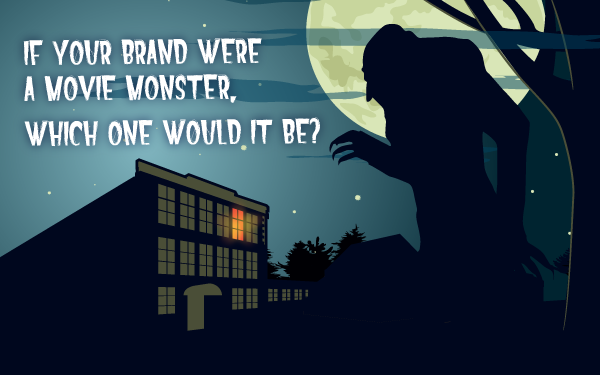 With the Halloween season upon us, let’s take a look at these archetypes under the paradigm of famous movies monsters and explore their strengths and weakness. Which one do you think your brand most closely matches? The Innocent is a simple, loyal brand that strives to be good. These companies conjure feelings of strong moral values and nostalgia. Examples include Dove and Cottonelle. On the flip side, The Innocent runs the risk of naivety, paralleling Frankenstein’s Monster’s inability to know his own strength or understand social cues. This archetype is rooted in a down-to-earth, person-next-door mentality. The Regular Guy/Gal is relatable and gives a sense of belonging. Examples include Home Depot and eBay. However, companies who adopt this ethos may lack a distinct identity and personality. It’s important that the Regular Guy/Gal finds a way to stand out from the rest of the horde that’s also hungry for your consumer’s mindshare. Like King Kong, The Hero is courageous, bold and strong. The Hero wants to leave a positive mark on the world and inspire others to do so. Examples include Nike and BMW. Before his capture and enslavement, King Kong was worshipped as a god. He represents the awesome power and unlimited possibilities of nature. Unfortunately for King Kong and The Hero archetype, both can be held back and shackled by perceptions of arrogance and selfishness. While the goal is to hold your audience’s attention captive, try not to elevate yourself by destroying those who stand in your way. The Outlaw lives to break the rules. This archetype is rebellious and works to pave the way for change. Examples include Harley-Davidson and T-Mobile. While this devil-may-care attitude is fantastical and enchanting, the danger with The Outlaw is overdoing it. You don’t want to take it too far outside the law and amass a following of ill-intentioned fanatics, like Voldy did. Not even unicorn blood can bring a brand back from that sort of association. If your consumer finds fulfillment through discovery and new experiences, your brand may fit The Explorer archetype. The Explorer is adventurous, ambitious and pioneering. Examples include Jeep, Red Bull and North Face; it’s for those who wish to, for example, conquer the mysteries of the Antarctic. For Explorer brands, authenticity is of the utmost importance. Any suspicion that your brand is inauthentic could result in its integrity being burnt to the ground. Like The Thing, The Explorer may find difficulties assimilating into the mainstream. Some may resist an Explorer who comes on too strong, like an overeager Malamute ready to conquer the world. The Creator is a world builder, a nonconformist and an artist. Brands who model themselves after this archetype want to make their mark on the world in a lasting and meaningful way. They foster imagination and inspire the extraordinary. Examples include Lego and Crayola. That said, The Creator may come across as a perfectionist or impractical. Like Jareth, The Creator could get overeager and attempt to bend others to their vision, instead of letting them explore the maze within themselves and find their own way to be creative. Naturally, The Ruler wants to rule. If done correctly, The Ruler archetype helps people create order from chaos and acts as a role model. Microsoft is a good example. But, if The Ruler becomes too authoritarian, they may find themselves unable to connect with others. An overbearing Ruler can quickly become a real witch. The Ruler may find themselves watching their consumers’ every move and squeezing power from those under their reign. If your brand is a Ruler, resist the temptation to call your flying monkeys and exercise totalitarian control. You’ll come across as a real wet blanket. The Magician wants to help people make their dreams come true and expand their consciousness. Examples include Disney and Apple. But, in their eagerness to transform the world, The Magician may take risks that lead to bad outcomes. That’s a sure way to turn your consumers’ dreams to nightmares. Intimate, sensual and romantic brands follow The Lover archetype. Examples include Victoria’s Secret and Godiva Chocolates. While The Lover helps people feel appreciated and builds lasting (say, even, immortal) relationships, if this archetype comes on too strong, it could be the final nail in the coffin for a brand. The Lover can border on obsessiveness. And what’s more obsessive than spending decades and spanning continents, seeking the reincarnation of your wife? The Lover also runs the risk of seeming not grounded in reality. Maybe that’s another reason Dracula travels with his own soil. And finally, The Lover can be taken advantage of — you could say they’re at risk of being sucked dry by the ones they love. The Caregiver wants to nurture others. These brands are selfless and maternal. Examples include Campbell’s Soup and Johnson & Johnson. In the right light, The Caregiver helps people care for themselves through health or education initiatives. But, The Caregiver can also take on a different personality that puts them in a place where they could be exploited or become overprotective. It is possible to kill people with kindness, and sometimes you need to know when to let go. Unless The Caregiver is genuine, these brands are easy for people to see through, and they wind up talking to themselves. If you overdo it, it might make consumers psycho. Fun, mischievous and irreverent, The Jester wants nothing more than to bring joy to the world. Ben & Jerry’s is one example. When people are looking to be impulsive and spontaneous, they may turn to The Jester. Yet, if The Jester doesn’t reign it in, this archetype may seem frivolous or disrespectful. Y’know, like the kind of person who would wreck a hotel for the fun of it, leaving a trail of destruction and half-eaten room service goodies in their wake. The Sage’s goal is to bring wisdom and insight to the world. They are a trusted source of information; an analytical, thoughtful and intelligent mentor. Examples include BBC and Google. The Sage strives to provide practical information and help people better understand the world. But, The Sage’s drawback is the propensity to be overly contemplative or too opinionated. It’s important to make information accessible; brand should use their skills to help people understand instead of asking them to solve a riddle. And, knowledgeable brands who get too full of themselves may make consumers feel inferior. In Hannibal Lecter’s case, it goes the other way: He is the consumer who gets full on those he deems inferior. Hopefully this has given you some real brain food to sink your teeth into… or at least a smile. Happy Halloween!